Northwest Recreation Center is having their annual Kite Workshop! Fly on by and learn how to make a kite before the annual Zilker Kite Festival! 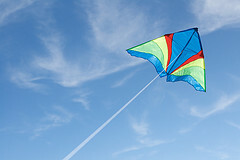 Children will have the opportunity to make multiple kites and then fly them in the park. Fly your kite and jump and jive to the jazz and swing tunes provided by Aunt Ruby’s Sweet Jazz Babies!